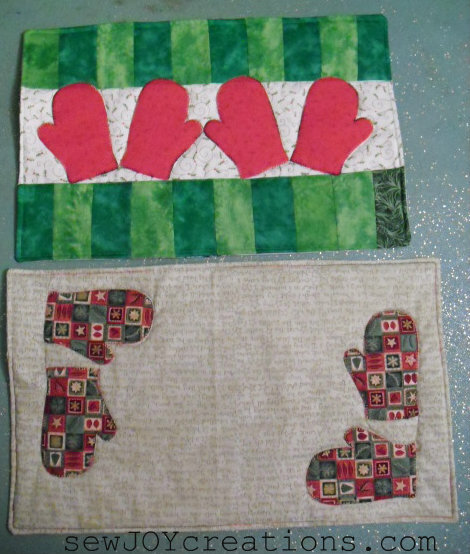 Placemats are great to make for gifts - or to keep! You can make one and give it to someone who lives alone or donate to your local Meals on Wheels. Or you can make them in sets. 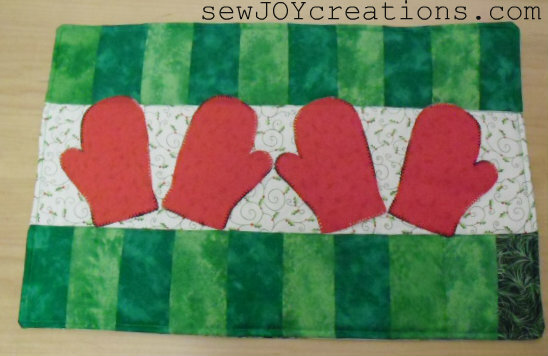 I decided to make a set of placemats, but not make them all match! This is easy and fun to do with your stash. I'll share a couple of guidelines so you can see the possibilities in your own stash! 1. Make them all the SAME SIZE. I make mine no bigger than a fat quarter of fabric. These placemats finish at 12 inches high by 19 inches wide. 2. Use the SAME BACKING fabric. Mine all have this floral fabric so I can flip them over for Easter! 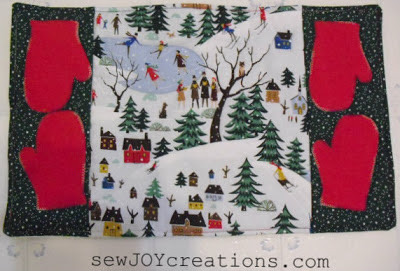 You could also use co-ordinating fat quarters from a line of fabric. The fabrics will match, but not be all the same. 3. Pick a COMMON THEME. 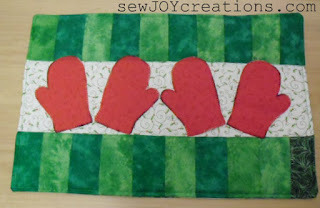 I included the mitten applique motif in my PLACEMATS FROM STASH TUTORIAL NOTES pdf. You can make your mittens all the same colour, from the same fabric line, or not! 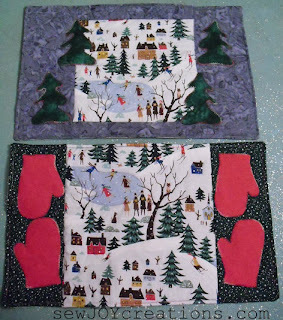 The bottom placemat in this photo was really quick and easy - 2 sets of mittens, 2 fat quarters, some batting and DONE! 5. HAVE FUN! Use up the novelty prints that you've been collecting. Find the bits and orphan blocks that have been waiting to play. 6. 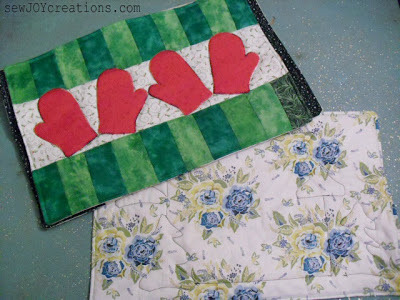 DOWNLOAD my PLACEMATS FROM STASH TUTORIAL NOTES. The measurements for the placemat directly above, with the print in the middle and pairs of mittens down the sides, are given. I might make more quick notes for the others. I used the envelope method to put my placemats together - a quick method that involves no binding. There's a quick diagram included on the pdf. 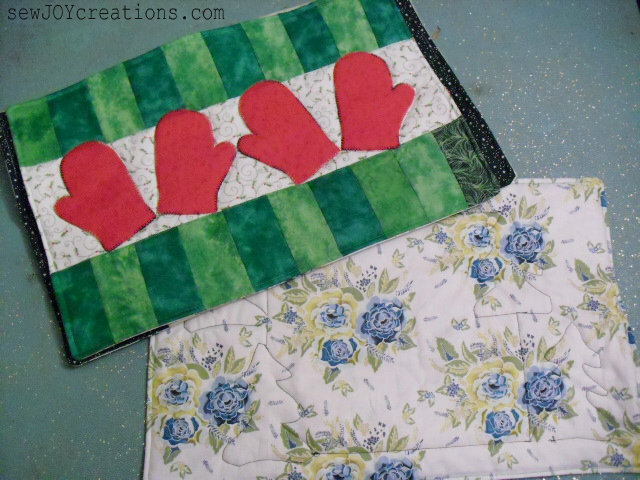 You can use binding if you want to - another opportunity to make your placemats MATCH by using the same binding. Enjoy making from your stash this holiday season!